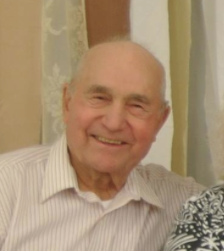 Julius J. Suppes – age 92, of Otis, Kansas died Monday, April 15, 2019, at Via Christi Hospital St. Francis, Wichita, Kansas. He was born May 13, 1926, in rural Otis, Kansas to Adam and Anna Maria “Mary” (Herrman) Suppes III. He married Elsie Jane (Holzmeister) on April 11, 1959, at Pfeifer, Kansas. Julius was a farmer and worked part time jobs as well. He grew up in rural Otis, Kansas and attended Otis High School. He was a member of St. Ann’s Catholic Church in Olmitz, Kansas, a Eucharistic Minister, also attended St. Mary’s Catholic Church in Loretto, Kansas and was a member of the LaCrosse Knights of Columbus Council No. 2970. Julius was a faithful Christian role model always thinking of others, enjoyed KU basketball, Kansas City Royals, going to dances and he loved to Polka. He was an attentive grandfather that loved to hold and play with his grandchildren. Survivors include his wife, Elsie Suppes, of sixty years, Locust Grove Village Care Center, LaCrosse, KS; three sons, Patrick Suppes and wife, Kathleen, Otis, KS; Glen Suppes and wife, Rita, Lindsborg, KS; Jesse Suppes and wife, Lori, Salina, KS; one daughter, Wanda Dietz and husband, Bob, Smith Center, KS; one twin brother, Eugene Suppes and wife, Alma, Great Bend, KS; one sister-in-law, Mary Louise Suppes, Otis, KS; 14 grandchildren and 20 great grandchildren. He was preceded in death by his parents; four brothers, Tony Suppes and his wife, Agnes, Primus Suppes and his wife, Delores, Reinhold Suppes and his wife, Ruby, Clarence Suppes; two sisters, Helen Schuckman and her husband, Herbert, Ruth Engel and her husband, Eddie and three infant grandchildren. Funeral services are at 10:00 A.M. Thursday, April 18, 2019, at Holy Cross Catholic Church, Pfeifer, Kansas. Burial in Holy Cross Cemetery, Pfeifer, Kansas. A vigil service is at 7:00 P.M. Wednesday followed by a LaCrosse Knights of Columbus rosary at 7:30 P.M. both a Cline’s-Keithley Mortuary of Hays, 1919 East 22nd, Hays, Kansas. Visitation is from 6:00 to 8:00 P.M. Wednesday, at Cline’s-Keithley Mortuary of Hays and from 9:00 to 10:00 A.M. Thursday, at Holy Cross Catholic Pfeifer, Kansas. In Lieu of flowers the family suggests memorials to Holy Cross Charities Inc. and masses.